In 2009, writer Nora Gallagher was told her right optic nerve was inflamed, its cause unknown, a condition that, if left untreated, would cause her to lose her sight. And so began her departure from ordinary life and her travels in what she calls Oz, the land of the sick. Based on her arduous journey, Nora offers deeply felt meditations on suffering and vulnerability. A Sermon on vulnerability, "The Break in the Narrative," at the Washington National Cathedral. For medical audiences: What doctors and clinic staff might learn from a well-formed, articulate patient about the country patients are living in as well as vulnerability and its ramifications for medical relationships. Faith audiences: Gallagher offers a nuanced discussion of faith—as she has in her prior memoirs--that will interest spiritually minded readers as well as anyone interested in living an introspective life. Her lectures regarding vulnerability are of particular interest to those communities seeking a way to revive Christianity in this challenging time. Gallagher describes her personal experience pulling back from the Christianity formed in the 4th century (the empire’s religion) and returning to an earlier path, made by followers of Jesus, not as King but as fellow sufferer. General audiences: With unerring candor, and no sentimentality whatsoever, Gallagher describes the unexpected twists and turns of the path she took through a medical mystery and an unfathomably changing life. She gives us a singular, luminous map for traversing dark landscapes. She sheds light on the misunderstood idea of vulnerability and its gifts. In her novel, Changing Light, Nora Gallagher asks: what would have happened had one of the physicists from Los Alamos decided to leave the Manhattan project and work against it? The result is a love story set in the summer of 1945 in the shadow of Los Alamos and the making of the first atomic bomb. In this talk, Gallagher explores writing and imagination and our capacity to find moral clarity by bringing to light a shadowed history. Many of us have skewed ideas about how to write. Well-meaning professors who were not writers taught outlines, the three-point essay, and “ transition” sentences. Add church lingo and religious clichés and you’ve got writing that often ends up solipsistic or, worse, dishonest. This workshop puts many writing doctrines aside and replaces them with different, more active and alive methods of discovering voice. In addition, participants may find that faith can be clarified or revived by the practice of good writing. 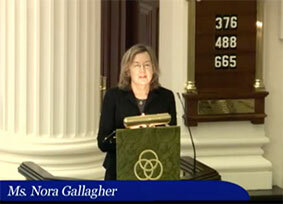 Nora Gallagher speaks, preaches and leads writing workshops. For appearance and lecture inquiries, please contact Kate Berner or visit the Random House Speakers Bureau. She has lectured at Yale University, Washington’s National Cathedral, Yale Divinity School, and Church Divinity School of the Pacific among many others. 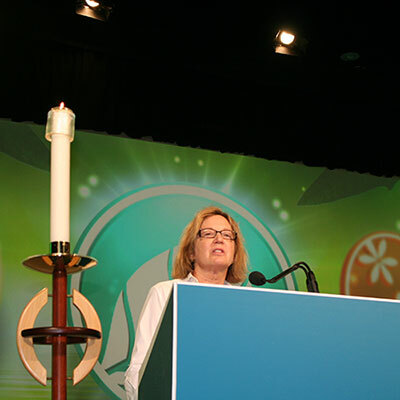 She is preacher-in-residence at Trinity Episcopal Church, Santa Barbara, and has preached in churches nationwide, including Stanford University's Memorial Church; St. Mark’s Cathedral, Seattle; Church of Heavenly Rest, New York; St Bartholomew’s, New York; Grace Cathedral, San Francisco; St. Paul’s Cathedral, San Diego; St. James, Richmond and the Triennial Gathering of Women of the Evangelical Lutheran Church of America. She has lectured on writing and taught writing workshops at Yale Divinity School and the Festival of Homiletics as well as at The Cathedral College, Sacred Circles and other communities with grants from the Louisville Institute. Nora Gallagher has given readings at bookstores across the country including: Elliott Bay Books, Seattle; Book Passage in the Bay Area; Bainbridge Island’s Eagle Harbor Books and Magers & Quinn, Minneapolis. She has appeared at the Los Angeles Times Festival of Books, UCLA campus; Search for Meaning, Seattle; Aloud: Los Angeles Public Library Writers series; Santa Barbara Writers Conference and Dimensions of Faith, Louisville.